Is your old torque tube noisy and causing vibration? If so it is likely the bearings have failed and require replacement. We offer kits of parts to replace the bearings yourself as well as a complete bearing replacement service with the option to blast and repaint your existing torque tube. We have made a custom hydraulic press to remove and install the torque tube bearings without damaging the bearing carriers and ensuring proper alignment when refitting. 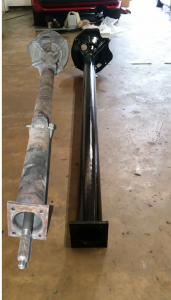 Our refurbishment service requires your existing torque tube to be removed from the car and shipped to us. We can provide a complete torque tube removal, refurbishment and installation service at our workshop. You can purchase a torque tube rebuild via our web store. Torque tube rebuild kits also available via our web store.